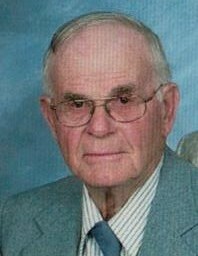 Wayne P. Dauch, 96, of Clyde, died at the Willows in Bellevue on Monday, April 8, 2019. Wayne was born in Erie County on April 24, 1922 to Pierre and Grace (Camp) Dauch. He was a 1940 graduate of Townsend High School. Mr. Dauch was a lifelong farmer. He had been a share owner of the former 7 Limers of Bellevue as well as an employee of the State of Ohio Experimental Center. While working at Seven Limers, he was instrumental, along with Ohio Edison, in the Solar Tunnel Project. He was a member of Immaculate Conception Catholic Church; a past President of the Townsend/ Margaretta School Board; He was a former Trustee for Townsend Township, and had served as the President of the Sandusky County Trustees Association. For over fifty years, his wife, Helen and he were members of a card club, which he had been the last survivor, He was also a card player at the Riley Country Club. On January 9, 1947, he married Helen Pawolski. She preceded him in death on April 16, 2013. Survivors include three daughters, Patricia Sengstock of Clyde; Kathleen (Dan) Michel of Castalia; Paula Dauch of Clyde; one son, David Dauch of Clyde. Seven grandchildren, Tony, David; Brian; Brad; Jeremiah; Nicole and Jason., two step grandsons, Brian and Jason, along with 21 great grandchildren. His brother, Charles Dauch of Clyde also survives. Wayne was preceded in death by his father, Pierre, his mother, Grace Dauch Warner; a son, Roger Dauch; two grandsons, Bradley and Jamie; two brothers, Robert Dauch and Paul Dauch, and sisters, Amelia Keegan and Eloise Dauch, in infancy. Vistation will be on Thursday, April 11, 2019 from 4-7:00 pm at Auxter Funeral Home, 1105 Castalia St., Bellevue. The funeral mass will be on Friday, April 12, 2019 at 10:30 AM at Immaculate Conception Catholic Church, Bellevue with Rev. Jonathan Wight officiating. Burial will be in Parkhurst Cemetery. Memorials may be made to IC School Tuition Fund.